This is the third installment in a series articles on leading business conglomerates in Korea and around the world covered by the writer, a specialist in the business world in Korea and outside the world. Park was formerly the director of the Business Bureau of The Korea Times, a leading independent English daily in Korea. Park joined The Korea Post media in 2003, which now own and operate 3 English and 2 Korean-language media outlets since 1985. Vice President Park is assisted by Reporter Ms. Sua Kim.—Ed. Vice Chairman Lee Jae-yong (better known as Jay Y. Lee in the West) accompanied President Moon Jae-in during Moon’s visit to Pyongyang on the occasion of the 3rd Inter-Korean Summit Meeting in Pyongyang on July 18-20, 2018. Moon was accompanied also by the leaders of three other jaebeol business groups, e.g., Hyundai, SK, LG, and the heads of four major business-related associations. 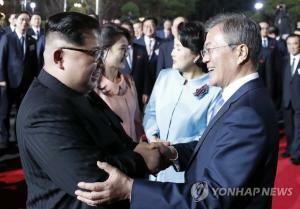 This is considered a very welcome development in the government-business relations in Korea following the birth of the Moon government on May 11, 2017. This is because it is construed in the Korean society, notably in the business world, as a sign of an end to the period of Jaebeol-taming which all but invariably followed the change of government in Korea—from Park Geun-hye to Moon, Lee Myung-bak to Park, Roh Moo-hyun to Lee MB, and almost all their predecessors. 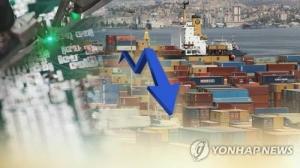 On this situation, the majority of the Korean people, especially those who want continued economic development and growth of Korea, take sides with the businesses because they view them as the main source of economic development and growth of the country. Korean businesses, especially Samsung, perform the role of a dependable locomotive in helping the government leaders explore and develop diplomatic relations economic cooperation with other countries. 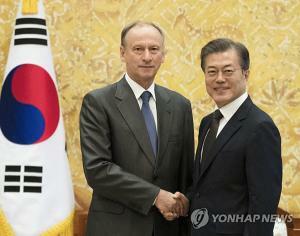 Deputy Prime Minister Ri Ryong Nam of North Korea (right) receives Korean busienss leaders visiting Pyongyang accompanying President Moon Jae-in on Sept. 18-20, 2018. 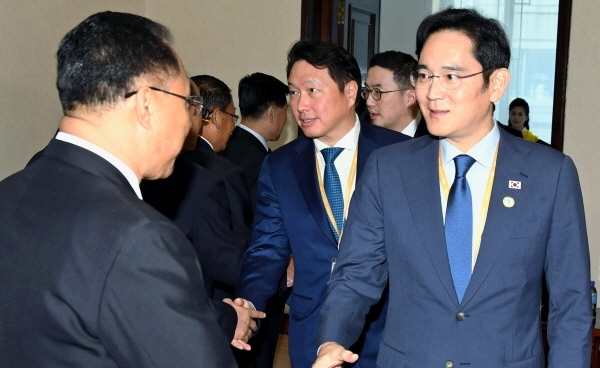 On the right, foreground, is Vice Chairman Lee Jae-yong of Samsung Electronics shaking shakes hands with Ri followed by other Korean jaebeol busienss leaders. 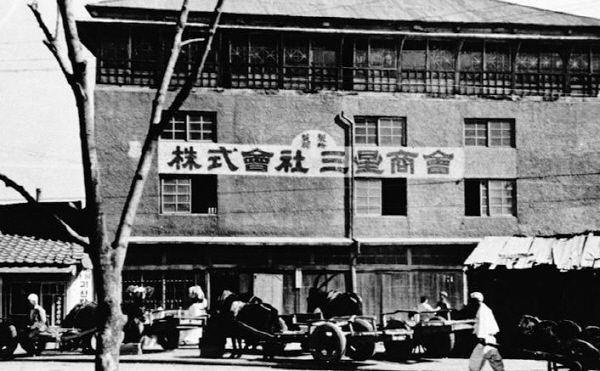 ‘Samsung Store Co., Ltd.’ (name of sign) was the name of the original company of today’s Samsung Business Group established during the Japanese Occupation Era of the Korean peninsula in 1938. 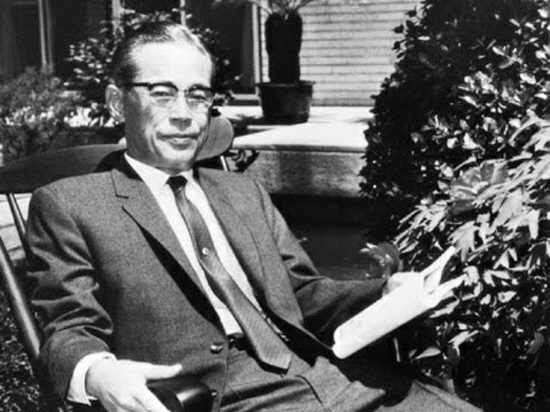 Founding Chairman Lee Byung-chul of the Samsung Business Group. 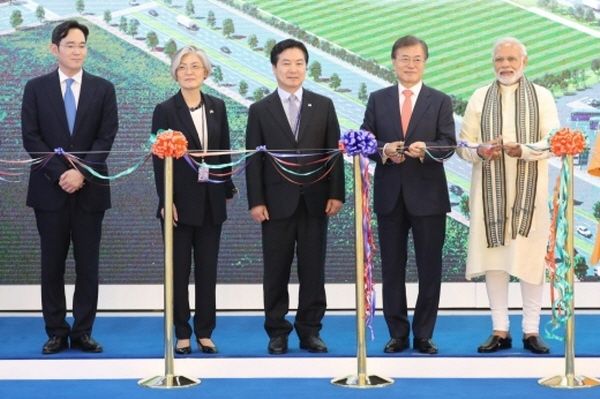 President Moon Jae-in and Prime Minister Narendra Mobi of India (fourth and fifth from left, respectively) cut tapes to open the Samsung electronic plant in India. 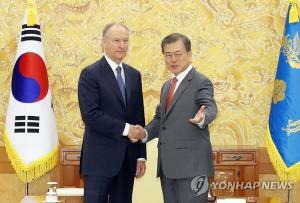 At fr left is Vice Chairman Lee Jae-yong of Samsung Group ant on his right is Minister of Foreign Affairs Kang Kyung-wha. Notable Samsung industrial affiliates include Samsung Electronics (the world's largest information technology company, consumer electronics maker and chipmaker measured by 2017 revenues, Samsung Heavy Industries (the world's 2nd largest shipbuilder measured by 2010 revenues), and Samsung Engineering and Samsung C&T (respectively the world's 13th and 36th largest construction companies). 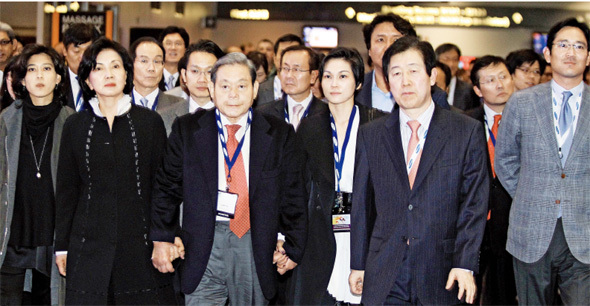 Chairman Lee Kun-hee the Samsung Group and his spouse Madam Hong Ra-hee are with other member s of the Lee Family of Samsung. At far right is Vice Chairman Lee Jae-yong of the Samsung Group and at far left is Chairwoman Lee Boo-jin of Hotel Shilla. 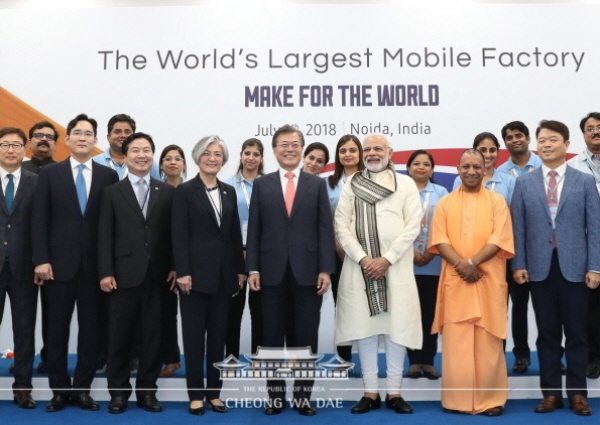 President Moon Jae-in and Prime Minister Narendra Mobi of India pose for the camera with the leading members of their government in Noida, India on July 9, 2018 at the dedication ceremony of the ‘World’s Larget Mobile Factory in India’ built by Samsung. Vice Chairman Lee Jae-yong of Samsung is seen third from left, with Foreign Minister Madam Kang Kyung-wha (seventh from left) with the other leading figures from Korea and India. In 1947, Cho Hong-jai, the Hyosung group's founder, jointly invested in a new company called Samsung Mulsan Gongsa, or the Samsung Trading Corporation, with the Samsung's founder Lee Byung-chull. The trading firm grew to become the present-day Samsung C&T Corporation. 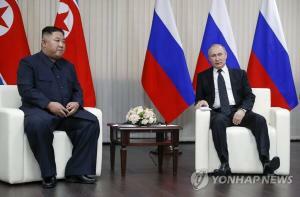 After a few years, Cho and Lee separated due to differences in management style. Shinseki (discount store, department store) was originally part of Samsung Group, separated in the 1990s from the Samsung Group along with CJ Group (Food/Chemicals/Entertainment/logistics), and the Hansol Group (Paper/Telecom). As of 2012, Samsung has invested more than US$13,000,000,000 in the Austin facility, which operates under the name Samsung Austin Semiconductor. This makes the Austin location the largest foreign investment in Texas and one of the largest single foreign investments in the United States. Lee started working for Samsung in 1991. He began serving as vice president of Strategic Planning and then as "Chief Customer Officer," a management position created exclusively for Lee. Throughout the history of Korean big business, the jaebeol group leaders suffer following the change of government, and Samsung is no exception. The case could be traced back to the shift of the father-to-son ownership of Samsung in 2014. 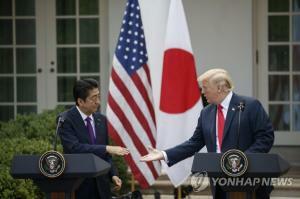 His suspected involvement in bribery with the then President Park Geun-hye, which was first brought to the table by an arrest warrant issued by the Prosecutor's Office in January, which led to his arrest in mid-February. On Jan. 12, 2017, the Special Prosecutor's Office stated that it would decide "soon" whether to seek an arrest warrant for Lee. He was questioned for more than 22 hours for suspicion of illegal activities including bribery in a scandal that consumed President Park Geun-hye. On Jan. 16, 2017, when the Prosecutor's Office finally decided to seek an arrest warrant for Lee, the warrant was denied based on a court ruling from January 19, with the Central District Court Justice Cho Eui-yeon stating that it was "difficult to recognize the need" for his incarceration. On Feb. 17, 2017, Lee was "formally arrested after the Seoul central district court issued a warrant on the night" of Feb. 19 for "handing bribes worth almost £30m to then President Park Geun-hye and her close friend, now-discredited Madam Choi Soon-sil to win government favors for a smooth leadership transition." Subsequent to his arrest, Samsung admitted to making contributions to two non-profit foundations allegedly controlled by Madam Choi and her Germany-based firm, but denied such contributions were related to the 2015 merger. 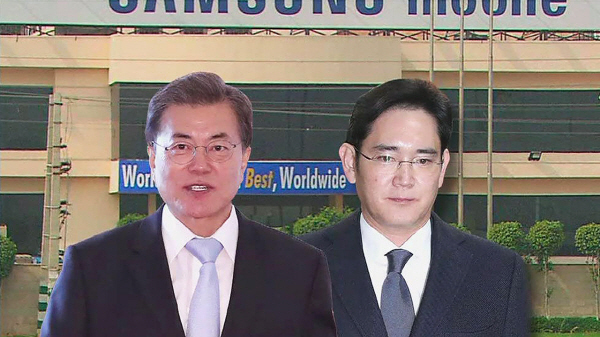 A spokesman for Samsung said: “We will do our best to ensure that the truth is revealed in future court proceedings.” On Feb. 28, 2017, The Wall Street Journal of the United States reported that "South Korean prosecutors said they would indict the Samsung conglomerate’s de facto leader Lee Jae-yong on charges of bribery and four other offenses." It was reported on Aug. 7, 2017, that prosecutors demanded a 12-year sentence for Lee. On Aug. 25, Lee Jae-yong was sentenced to five years in jail.In February 2018, Vice Chairman Lee was freed from jail after a South Korean court suspended his five-year jail term for bribing former President Park Geun-hye. 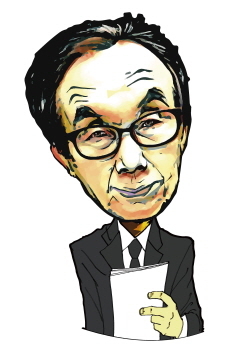 According to an article in Reuters, Vice Chairman Lee is known for his "cold" determination and polite, quiet demeanor. Lee is known to take time to reply personally to e-mails, and assumes a light-hearted attitude with reporters. Vice Chairman Lee, reportedly, is rarely seen in public and avoids publicity. He has two younger sisters, Lee Boo-jin, Lee Seo-hyun, and was the older brother of the late Lee Yoon-hyung. He has one son and one daughter with his ex-wife, Lim Se-ryung (daughter of the chairman of the Daesang Business Group), whom he divorced in 2009. Lee enjoys golf and horseback riding.